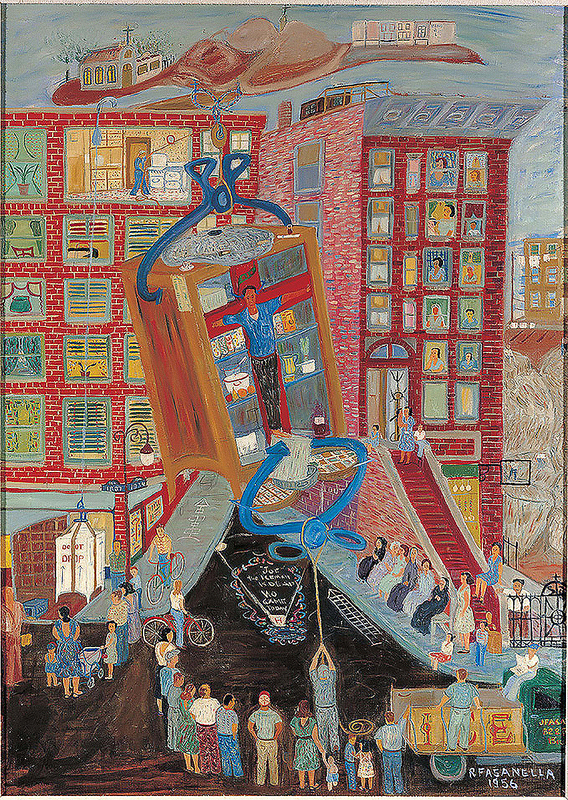 Ralph Fasanella (1914–1997) was a working-class New Yorker and renowned painter of “social reality.” Through his colorful and dense compositions, he depicted complex themes of social and political unrest, historic events, the importance of leisure, and the unique energy of New York City and its citizens. Born in the Bronx and raised in New York City’s Little Italy, Fasanella was the son of Italian immigrants who, like so many others, left their country in search of a better life. Fasanella’s working-class identity, formed during those early years, was one that endured throughout his life. Raised by a mother who was involved in labor rights and anti-fascist activism, Fasanella himself became an advocate for unionism and worked as an organizer—most notably for the United Electrical, Radio, and Machine Workers of America. Immediately prior to his union organizing, he fought against Franco’s army in the Spanish Civil War, as a member of the all-volunteer Abraham Lincoln Brigade. Fasanella’s early activities as a light industry worker and labor organizer gave way to his burgeoning interest in painting. In 1945, at the age of thirty-one, Fasanella began to draw as a way to alleviate pain in his hands. He attended some art classes, but he felt self-conscious about the pretensions of being an “Artist”; he came to terms with it by using his art as a tool to agitate for social change. He eventually transitioned out of his role with the union and devoted himself full time to his painting. Drawing upon the people, places, and social matters that surrounded him, Fasanella quickly developed a body of work and was offered exhibitions at the prominent ACA Galleries in New York in 1946 and 1947. However, after this brief period of art world recognition, Fasanella was blacklisted during the McCarthy era because of his leftist profile, and gallery interest ended abruptly. Through these and ensuing years, he maintained an earnest and consistent effort with his painting, while working at a family-owned gas station in the Bronx to earn an income. In 1972 Fasanella was “discovered” and featured on the cover of New York Magazine. Although he had been producing and showing his work on a regular basis at venues such as union halls, churches, and a variety of public spaces, the feature framed Fasanella as a “primitive” artist—a label he roundly dismissed. Nevertheless, it was this media attention that led to a turning point for Fasanella, who, at the age of fifty-eight, became able to focus his full attention on his artmaking. His incisive visual narratives continue to resonate with contemporary audiences, proclaiming social engagement and action as a primary effect of artistic expression. Image: Top: Ice Man Crucified #3, Ralph Fasanella (1914–1997), New York City, 1956, oil on canvas, 48 3/4 x 37 3/4 in., American Folk Art Museum, gift of Patricia L. and Maurice C. Thompson Jr., 1991.11.1. Without struggle, there is no reason to live. If you’re not struggling, you don’t deserve to be alive. For Ralph Fasanella, being an artist was hard work. Like his jobs as truck driver, machinist, union organizer, or gas station operator, Fasanella’s function as an artist was one he took on as a serious responsibility, even when it wasn’t providing an income. The struggle to find and keep gainful employment, to affect change in one’s life, to participate in culture in meaningful ways, and to support one’s family was a defining characteristic for Fasanella, both personally and artistically. Life is together. Fighting together, playing stickball together. People need each other. Fasanella understood painting as a social process. Observation of and interaction with others was crucial to his approach. The artist depicted his environmental, historical, and human subjects with a careful, highly practiced sense of detail and individuality, often sketching the world around him while riding on the subway, for example, or dining at a luncheonette. People were his passion. He claimed to know every person he painted, and modeled unique characteristics for each of the human figures he placed in his compositions. I think the only time a drawing or a painting is really successful is when you come out of it. The painter has to come out of it himself. Over the course of Fasanella’s fifty-two years as a practicing artist, his work evolved from the angst and radical politics of his youth, through the social and political engagement of the 1960s and ’70s, and into more personal and nostalgic reflections on his childhood, as in the Iceman Crucified series and other depictions of healthy civic and cultural life. In all of this, his work was bound to memory. Fasanella’s imagery is, in a sense, documentation. His paintings are documents of a certain time and place that the artist wanted to keep as part of the cultural consciousness; to tell stories and instruct the masses. The stories he told were ones of political upheaval, as in McCarthy Press; the monotony of a work-a-day life, as in Subway Riders; or relished moments of leisure and play, as in Coney Island. The elaborate geometries within his compositions helped to make sense of his densely arranged canvases and hold together their narrative structure. In creating these artworks, Fasanella was able to remind himself, and others, where they came from—and where they are going. I may paint flat, but I don’t think flat. In all of his work, Fasanella strived to depict collective experiences from a wide perspective. The masses of people, the panoramic formats and long angles, the exhaustive detail—all contributed to making Fasanella’s world multidimensional and diverse as a rule. He was able to convey familiar New York City scenes, political events, and immigrant stories so well because they weren’t only the products of observation but a vital part of the artist’s personal, lived experience. 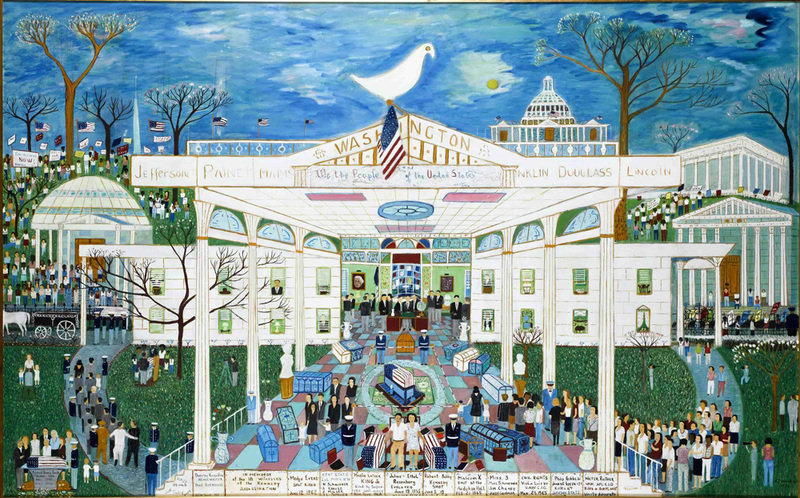 Image: Watergate, Ralph Fasanella (1914–1997), New York City, 1976, oil on canvas, 60 x 90 in., American Folk Art Museum, New York, gift of Eva Fasanella and her children, Gina Mostrando and Marc Fasanella, 2005.5.5. Since the early 1990s, the American Folk Art Museum has acquired more than one hundred works by the self-taught painter Ralph Fasanella, many of them gifts from the artist and his family. In 2005 the Estate of Ralph Fasanella made a donation of seven large-scale paintings to the American Folk Art Museum, augmenting the institution’s holdings with some of the most distinctive examples from the artist’s corpus. Between 2009 and 2013 the estate gave the museum a major gift of 102 preparatory drawings and sketches, along with a significant archive of Fasanella’s papers, establishing the largest public repository of the artist’s work. The archive, a vast resource for scholarship, includes correspondence, sketchbooks, notebooks, photography, professional records of note, source material, audio-visual media, publications, and clippings. The Ralph Fasanella Collection and Archive preserves and continues the artist’s legacy of social engagement. It is of particular interest to students and scholars who are completing research in the areas of art history, Italian-American culture, labor rights, social activism, and New York City history. 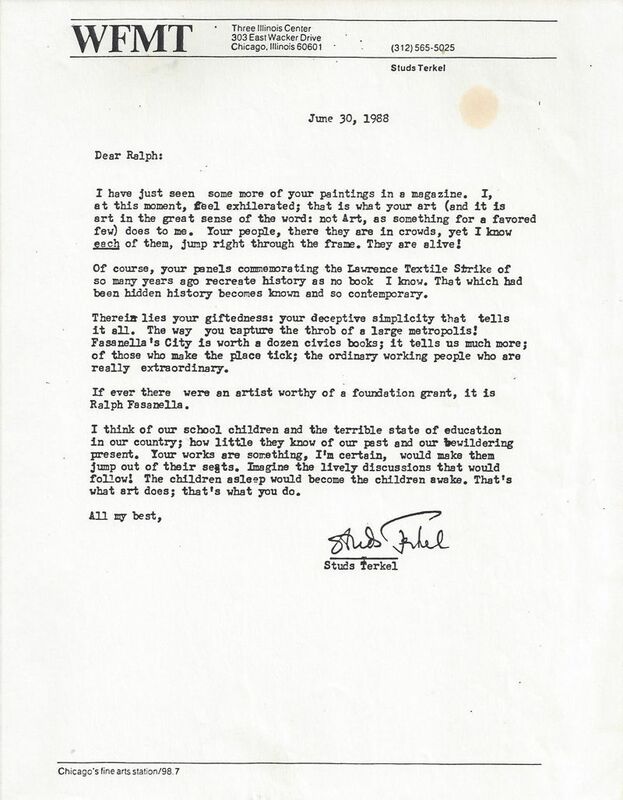 Image: Letter to Ralph Fasanella from Studs Terkel, June 30, 1988, American Folk Art Museum Archives, New York. This evolving selection of related resources on Ralph Fasanella and his work spotlights various media and essays by scholars and leading authorities on the artist. If you have additional resources to share, please e-mail info@folkartmuseum.org. Self-Taught Genius considers the shifting implications of a self-taught ideology in the United States, from a widely endorsed and deeply entrenched movement of self-education to its current usage to describe artists creating outside traditional frames of reference and canonical art history. Self-taught art, past and present, blurs frontiers between disciplines, makes definitions look constricted, and forces us to reconsider our assumptions about authoritative systems. These individuals have been active participants in the shaping of American visual culture, influencing generations of artists and establishing lively artistic traditions. Recast as self-taught geniuses, they fit within a pervasive but mutable self-taught culture, reflecting life in America as it has changed and as it has been ambitiously dreamed. Ralph Fasanella celebrated the common man and tackled complex issues of postwar America in colorful, socially minded paintings. This exhibition celebrates the one hundredth anniversary of the artist’s birth and brings together key works from a career spanning fifty-two years. Fasanella was born in the Bronx and grew up in working-class neighborhoods of New York; he became a tireless advocate for laborers’ rights, first as a union organizer and later as a painter. 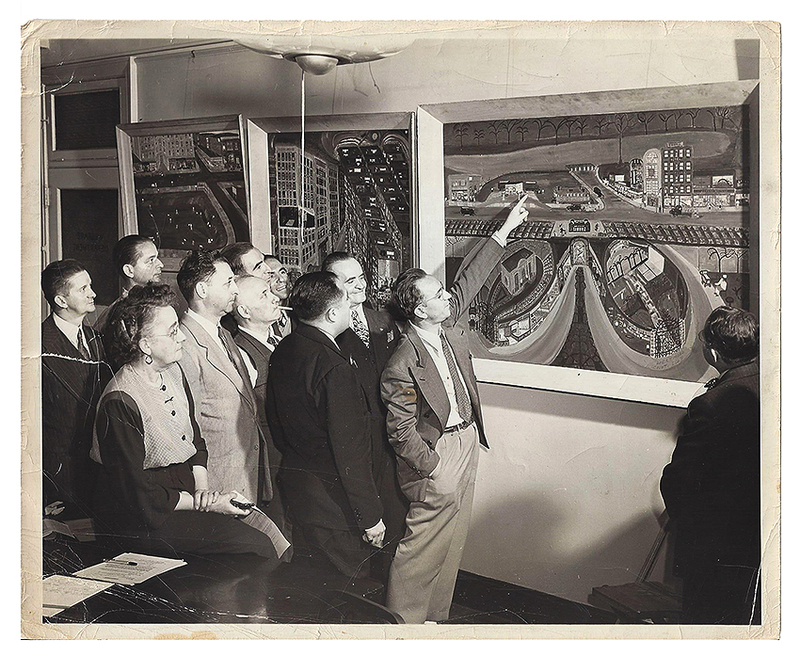 • Italics: Television for the Italian American Experience, interview with Valérie Rousseau, curator, self-taught art and art brut, American Folk Art Museum, about the exhibition Ralph Fasanella: Lest We Forget. 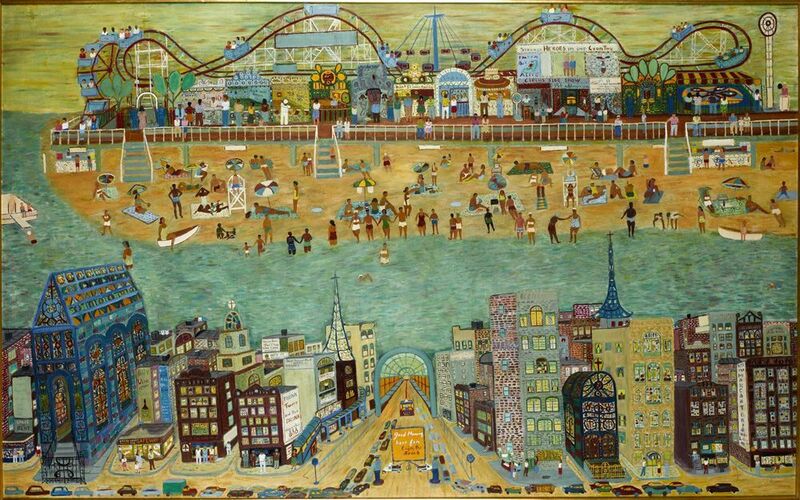 Image: Worker’s Holiday – Coney Island, Ralph Fasanella (1914–1997), New York City, 1965, oil on canvas, 59 x 96 1/2 in., American Folk Art Museum, New York, gift of Maurice and Margo Cohen, Birmingham, Michigan, 2002.1.1. 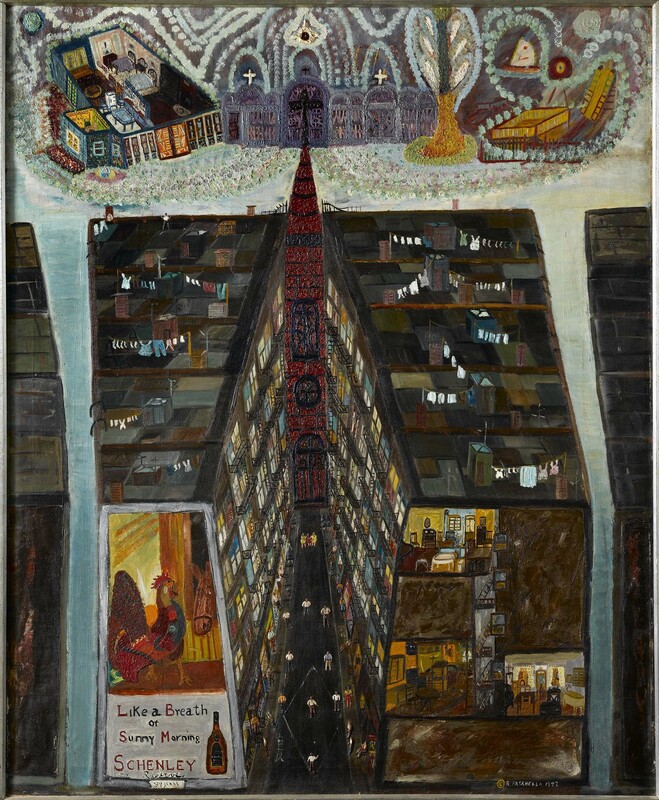 Image: Pie in the Sky, Ralph Fasanella (1914–1997), New York City, 1947, oil on canvas, 46 x 38 in., American Folk Art Museum, gift of Eva Fasanella and her children, Gina Mostrando and Marc Fasanella, 2005.5.4. 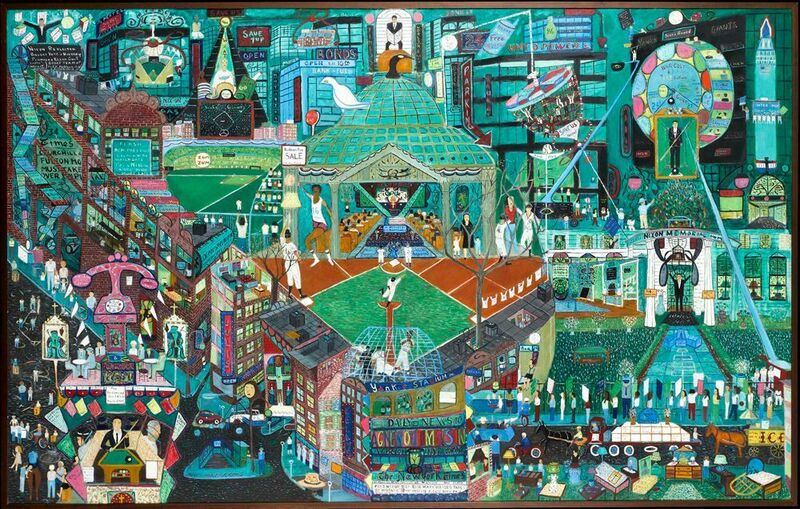 Image: McCarthy Press, Ralph Fasanella (1914–1997), New York City, 1958, oil on canvas, 40 x 70 in., American Folk Art Museum, gift of Eva Fasanella and her children, Gina Mostrando and Marc Fasanella, 2005.5.6. 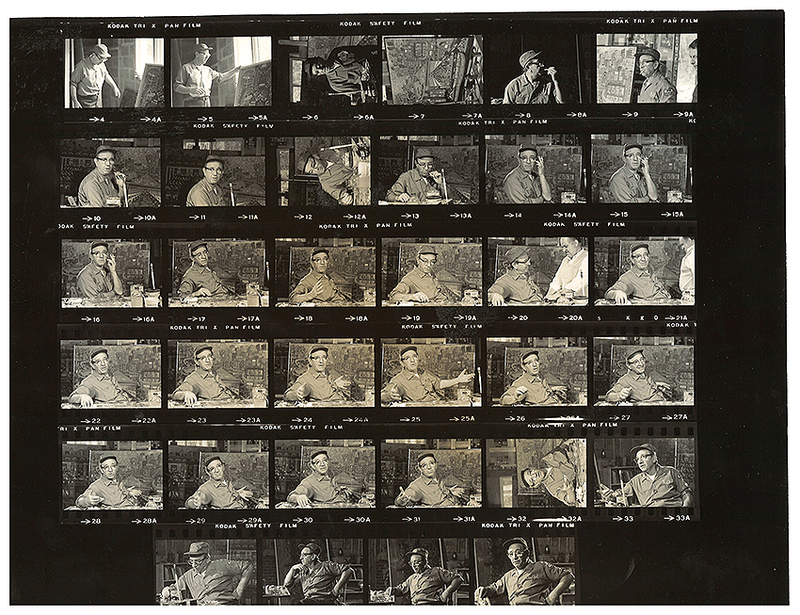 Image: Ralph Fasanella, photograph by Charmian Reading, 1972, black and white contact sheet print, American Folk Art Museum, gift of the estate of Ralph Fasanella, 2009. Image: Ralph Fasanella, photographer unidentified, n.d., black and white print, American Folk Art Museum, gift of the estate of Ralph Fasanella, 2009. 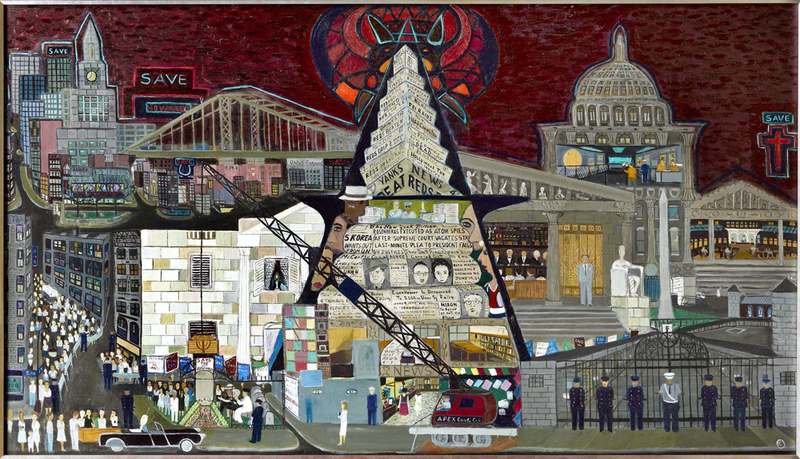 Image: American Heritage, Ralph Fasanella (1914–1997), New York City, 1974, oil on canvas, 50 x 80 in., gift of Eva Fasanella and her children, Gina Mostrando and Marc Fasanella, 2005.5.1.